Niagara Falls photographed November 23, 2006. One other first occurred that day, though I did not include it in the original blog post from 2006. It was also The Bear's first flight. Granted, she was the size of a peanut and would not actually be born until the following year, but it was technically -- very technically -- our first flight as a family of three. Our first landing (of 24 to date) at Pontiac on November 23, 2006. Photo by Kristy. At the time, this flight was a huge milestone for me. It was also our last time flying on Thanksgiving until 2017. Since 2006, we have celebrated Thanksgiving in New York with close friends and, in recent years, Mom has made the drive from southeast Michigan to join us. Because she was in no condition to make the trip this year, we resolved to go to her; preferably by air if at all possible. It would be our first Thanksgiving dinner with the family at my cousin's home since that day in 2006. November weather did us no particular favors, but permitted flight on Thanksgiving day at 3,000 feet to Oakland County International against a stiff headwind. Cloud layers prevented flight at higher altitudes. Forecasts along the route presented a single pinch-point; Buffalo was likely to go IFR that morning under a low ceiling with two mile visibility in snow. Surprisingly, Niagara Falls International just thirteen miles north of Buffalo expected higher ceilings (a "generous" 3,500 feet) and no snow. As I explained to Mom on the phone shortly before departure, if we got past the Niagara River, we would make it without problem. Normally, the thought of planning an extended cross country flight at 3,000 feet would make me cringe. Altitude equates to options by providing potential energy that can be exchanged for kinetic in the event of an emergency. But southern Ontario is extremely flat and open, a perfect emergency landing site stretching from Buffalo to Detroit. If we were departing in any other compass direction, I would want more altitude between the airplane and the terrain. 3000 feet over the Adironacks? Central Pennsylvania? No way. But over Ontario? I could accept 3,000 feet. Nevertheless, this would be the lowest altitude I had ever flown the route. Cruising to Michigan at a lowly 3,000 feet would introduce some additional minor challenges: the need to dodge stuff. Not cell phone towers, terrain, or anything physical, but airspace. Specifically, the restricted airspace over Niagara Falls, the Delta airspace around Niagara Falls International, and the Class E, D, and C Canadian Control Zones around St Catherines, Hamilton, and London, respectively. I plotted a course direct to Pontiac via AIRCO intersection to avoid the Niagara Falls flight restriction and decided to manage the other inconvenient obstacles en route based on which agency we were talking to at the time we encountered them. After a flurry of activity to get underway, the first step in our journey was a whimsical one. Tuning the Rochester ATIS broadcast that morning, we heard an advisory for "succulent birds in the vicinity". Rochester ATC slipped a Thanksgiving joke into their ATIS broadcast! A familiar controller put us into the system for flight following and wished us a happy Thanksgiving as we shuffled off to Buffalo. Our Warrior steadfastly plodded westward against the atmospheric current, her ground speed slowing into the 88-92 knot range. Ahead lay the Niagara River and a ceiling that angled progressively lower with distance from Lake Ontario, slanting earthward in our windscreen from right to left. Frequency chatter was dominated by icing reports from airliners as they descended through cloud strata on approach to Buffalo. Even if we were IFR capable that day, there would be no sampling of the clouds for us. From our position, we could see Niagara Falls and sunlight on Canadian soil beyond, but Buffalo was invisible, lost in the murk beneath that angled ceiling. The differential forecasts between Niagara Falls and Buffalo were spot-on. Ground track near Niagara Falls International from ForeFlight. Buffalo approach handed us off to Toronto Center well east of the international border. 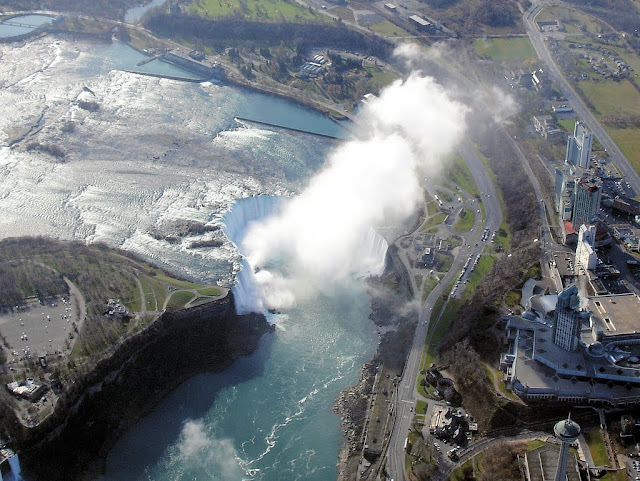 I realized that I had become too accustomed to IFR flying when we reached the Delta airspace around Niagara Falls International. While IFR, airspace mostly becomes invisible and, if a clearance passes through controlled airspace, then approval to enter that airspace is implicit. But we were VFR and I was speaking with a Canadian controller instead of Buffalo Approach (the controlling authority for the Delta), which meant that a hastily executed detour was in order. I cut it much closer than I should have. With that invisible obstacle managed, the next presented itself immediately, necessitating a frequency change to St. Catherines Radio to advise on our transition of the Class E Control Zone around St. Catherines airport. I was thankful (right day for it!) for the time I spent this summer learning Canadian airspace rules. Had Toronto handed me off to St Catherines Radio back in 2006, I would have been utterly baffled as to why I needed to contact a Flight Service Station for passage through Echo airspace. These are not procedures that come into play while flying in the United States. We also navigated around the irregularly-shaped Class D Control Zone surrounding Hamilton and ensured that our course would keep us clear of London's Class C Control Zone. Our low cruise altitude yielded a new perspective on southern Ontario; still sparsely populated, but the limited civilization below appeared in greater detail and made for a unique perspective on a route that has become so familiar over the last eleven years. After three hours at 3,000 feet (have I ever flown three hours at 3,000 feet before? ), Oakland County International finally emerged from the gloom. It was my fourth landing at Pontiac since Mom's diagnosis in September, but only the second time in eleven years that I landed on 27R. Parking on the ramp at Michigan Aviation, Scott emerged from the FBO to chock the airplane as he has so many times over the years. I called the day before to investigate whether I could plug in my engine heater overnight. The lineman I spoke with indicated that I could, but that it would be easier for them to push the Warrior into the hangar. "Your sheet says that you want your airplane in the hangar," Scott said to me as I climbed down from the wing. "Or we could just plug in the engine heater, whichever works." I'm flexible. Like his colleague, Scott decided that the hangar would be easier. "What is that going to cost?" I asked, suddenly anxious. Scott shrugged. "I'll write 'do not charge' on your sheet." Well, that was easy. A free hangar stay for the night? Who was I to refuse? Michigan Aviation has always treated us well. At Mom's, we had some time to play with the dogs before departing for dinner at my cousin's house in Oxford. When one of the dogs mounted one of the others, The Bear exclaimed, "Aw! They're having snuggle time!" This was quickly followed by, "What's so funny?" We received a warm welcome from my family when we arrived for dinner with nearly everyone reminiscing about how Kristy was pregnant with The Bear on our last visit. My cousin's daughter had announced her pregnancy at that same Thanksgiving dinner in 2006. Having successfully reached the grand old age of ten, both former fetuses spent much of Thanksgiving 2017 playing together. On-line research was necessary for us to parse their exact relationship and we concluded that he was The Bear's second cousin once removed. My uncle's absence was keenly felt on this first Thanksgiving since his passing. If anything, it made me appreciate the family still around me all the more. 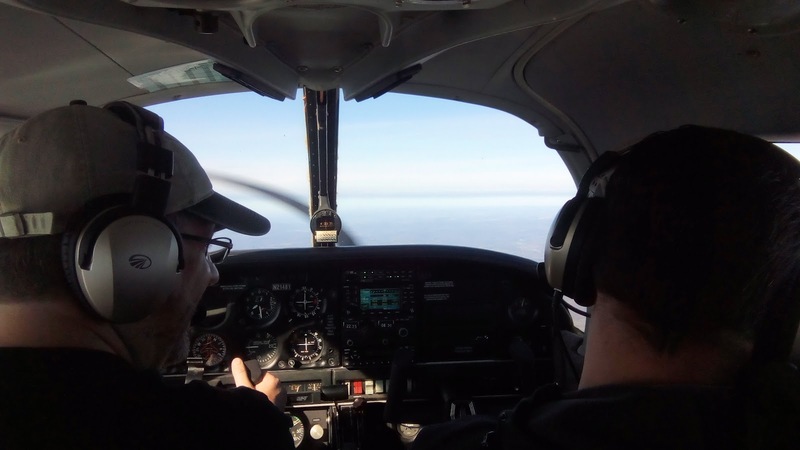 A 30 knot tailwind was expected to propel us back home accompanied by an AIRMET for turbulence from the surface to 12,000 feet that enveloped our entire route. Best case scenario was smooth sailing, worst case scenario was getting knocked around the entire way home. Waiting was not an option; surface gusts and low level wind shear were expected to increase throughout the day. We stopped at our favorite breakfast spot in Clarkston for people fuel, then proceeded directly to the airport without delay. Michigan Aviation had pulled the Warrior out of the hangar and topped off her fuel tanks. She was waiting for us on the ramp, warm(ish) and ready to go. Pontiac Tower was too busy to put us in for flight following that morning. "Cherokee Four Eight One, cleared for take-off runway 27L, east departure approved." That was the last call directed at us by Tower. Surface winds were eleven knots out of the southwest. Climbing out, we were shaken by turbulence and the stall warning horn squawked as we passed through a shear layer and into the high velocity air aloft. Still at pattern altitude and indicating 80 knots in the climb, Warrior 481 was already showing a ground speed of 120 knots. Screen shot from ForeFlight near London, Ontario showing a 150 knot ground speed in level flight. We climbed to 7,500 feet in the smooth current flowing eastward, our ground speed constant at all altitudes in the climb. Usually, wind speed increases with altitude, but not that day. My mind conjured an image of the atmosphere as a snowplow, a vertical wall several thousands of feet tall moving over the Earth just two thousand feet above the surface. It was no wonder that there was a low level turbulence warning; the shear layer between the snowplow and the surface air was bound to be abrupt and unpleasant. We maintained approximately 150 knots (173 mph) of ground speed for the entire route home in perfectly smooth air. "Cherokee Four Eight One, radar services terminated, squawk twelve hundred." Selfridge Approach put us in for flight following across the border, but dropped us once we were in Canada without recommending a frequency for additional flight following. The possibility of this exact scenario had kept me up the night before our first trip through Canadian airspace in 2006. In 2006, I would not have known who to call next. In 2017, I consulted the low altitude IFR en route chart, found the Toronto Center frequency for my region of airspace, and was soon back on a discrete transponder code with Canadian ATC. It is amazing what a decade of experience and some additional training can do for one's ability to manage minor issues in flight. The rest of the flight passed incredibly quickly and, before long, Rochester was in sight. On descent, we maintained a constant ground speed until about 3,00 feet when we hit the shear layer again. Warrior 481 shook significantly for a few moments as our ground speed abruptly dropped to almost match our airspeed. There were definitely some potholes on the exit ramp from the express lane. When we touched down in erratic wind at Sodus, the transponder showed a flight time just shy of two hours and one minute. I asked The Bear if she felt like the fastest bear alive. Our round trip Thankgiving flight this year was an absolute mess of contradictions. It was slow and fast, routine and yet still novel, a happy family reunion and a melancholy reminder of loss. On this Thanksgiving, I found myself thankful for family, thankful for my first decade as father to The Bear, and thankful for the eleven years of aeronautical experience that I have had the good fortune to accumulate since our previous Thanksgiving flight. Non-aviators might struggle to understand the attraction behind the so-called $100 hamburger (or $100 pancake, or $100 omelet, or -- if flying to Kalamazoo -- $100 Erbelli's calzone). Why would anyone spend money on flying an airplane just to grab a burger? The most important thing to understand about the $100 hamburger is that the hamburger itself is not the point. It's an excuse to take wing, to explore the world, to have new experiences, and to share camaraderie with other pilots. I can make hamburgers and pancakes at home, but $100 hamburgers are always served with a side of aeronautical adventure. By my reckoning, I flew sixteen $100 hamburger flights in 2017. A few were solo (e.g., Bethany's at Block Island State Airport). Some were with Kristy and The Bear, often as required en route during longer journeys (e.g., Le Bistro M in Bromont, Quebec or Ali Baba in Morgantown, WV). 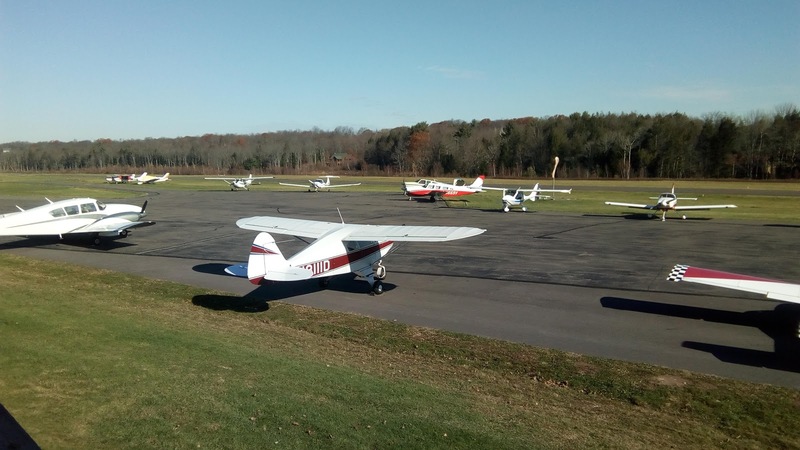 The majority of them included members of the Williamson Flying Club with up to seventeen participants flying to a destination together in as many as seven aircraft (e.g., Lake Placid, NY and the EAA pancake breakfast in Elmira, NY). In all cases, even when the meal is good, it is the journey that makes it all worthwhile. My good friend Ed earned his private pilot certificate in late September, coincidentally a day before my fifteenth anniversary as a private pilot. He recently checked-out in the club's Archer, Eight Five X-Ray. With keys in hand to something more closely resembling a travelling airplane, Ed was looking for an excuse to stretch his wings. He suggested a breakfast run and I suggested a destination: the Cherry Ridge Airport Restaurant in Honesdale, PA. From there, a mission was born. I invited Scott and Jamie to join me in the Warrior for the trip. We set out shortly after 8:00 am with Ed flying approximately five miles ahead in Eight Five X-Ray. The first snowfall of the season occurred earlier that week and the remnants still lingered on higher terrain between the Finger Lakes. "The trick to dealing with the sun in flight is to not look at it." It was a beautiful morning to fly and the air was utterly still. Warrior 481 tracked so true that Jamie asked if the autopilot was engaged. Autopilot? Clearly he has my airplane confused with a fancier ship. 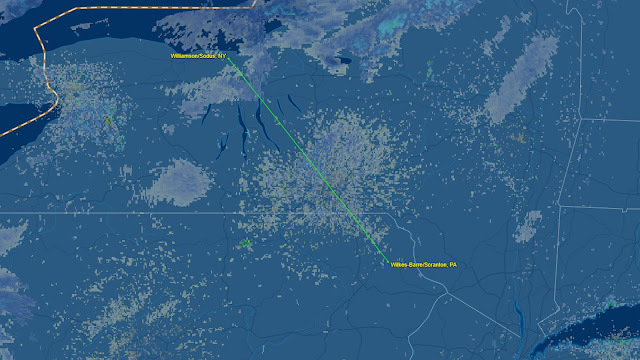 Ground track from Williamson-Sodus to Cherry Ridge from FlightAware. Though Ed had a five mile head start, Eight Five X-Ray gradually transformed from a tiny dot in the windscreen to an airplane-shaped flying object as we gradually overtook him. While planning the trip, I was concerned about available ramp space at Cherry Ridge during the breakfast rush. I need not have worried. A relatively early arrival meant that ours were the first two airplanes on the ramp that morning. They were soon joined by many others, but for us, parking was a snap. Scott, Chris, and Ed. Photo by Jamie. Mission accomplished! 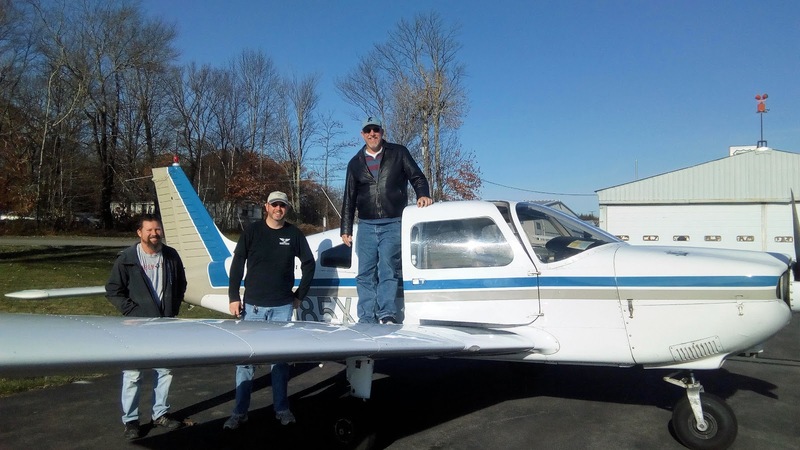 It was Ed's first flight of any distance in the Archer, his first landing in a state other than New York, and his first "destination" since passing his check ride! It was a big day regardless of the particular $100 foodstuff he chose to consume at the point of landing. Some Pipers are bigger than others. Walking around the twin, it became clear to me why the Aztec is so often referred to as the "Az-truck". It was a monster. A full ramp after breakfast. Photo by Jamie. Apparently, the early bird gets the ramp space. The parking apron at Cherry Ridge filled quickly with a variety of aircraft after we landed. While watching aircraft arrive for breakfast, we were surprised to see Six Echo Sierra, the club's Skyhawk. We introduced ourselves to Bob, the WFC member flying; we did not already know each other. Ten years had passed since I last dined at Cherry Ridge. Mom was with me on that flight. Restaurant ownership has changed, but everyone's breakfast was excellent and the view of the runway from the second story eatery was as excellent as before. I remember my first breakfast flight as Pilot in Command well. I launched from Three Rivers in Seven Zero Romeo and rendezvoused with the "South Haven Tribe" (two Cherokees and a Super Decathlon out of my future home base) en route to Coldwater, MI. Ron and Carl over southwest Michigan, photographed 21 Sep 2003. I recall seeing the other airplanes emerge from the morning haze and following them to our destination. Inbound to Coldwater, I had my first experience with wake turbulence when Carl, who was flying some distance ahead, abruptly veered in front of me. The abrupt roll moment that I experienced when I rode through his wake was a learning experience and memorable encounter. 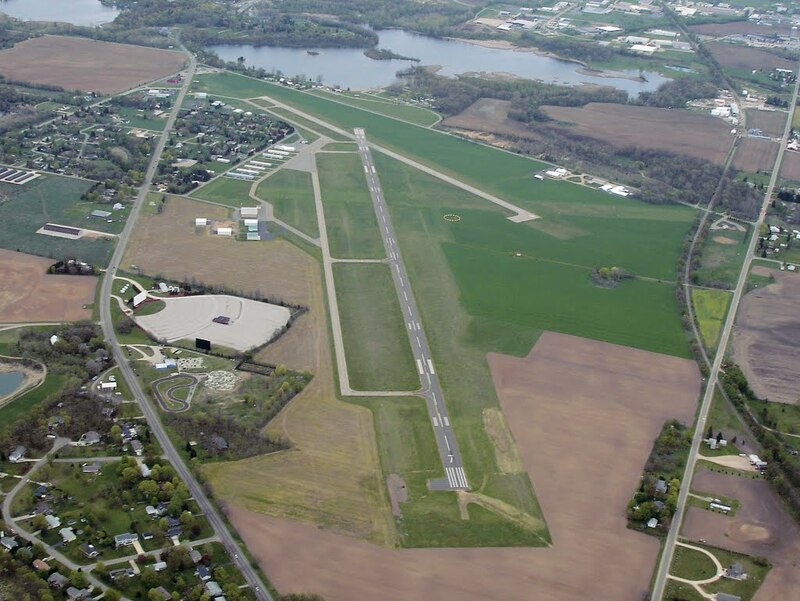 Coldwater - Branch County Memorial Airport (OEB) looking to the northeast, photographed 29 April 2006. 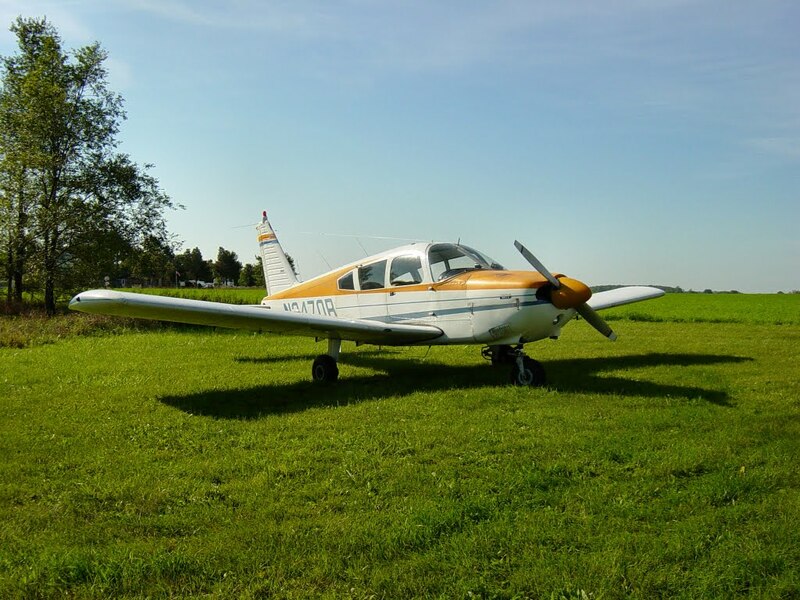 After landing, I followed the other three aircraft to the far northeast corner of the airport and then, to my surprise, off the pavement and along a grass taxiway that led to a restaurant hidden by a low hill. Seven Zero Romeo parked at Coldwater, photographed 21 Sep 2003. 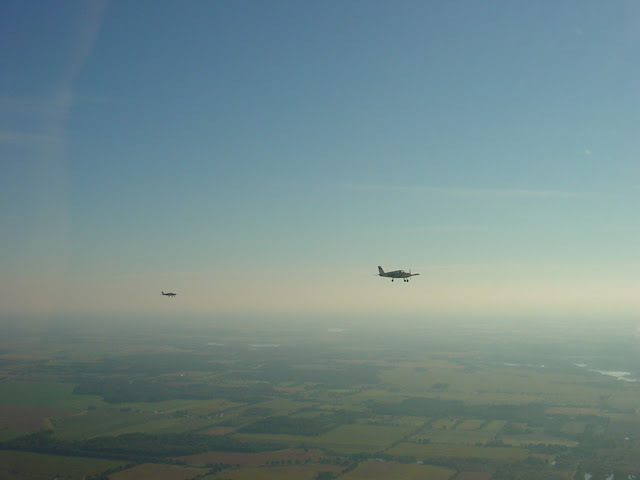 My first $100 hamburger run as PIC is one of my strongest early flying memories. Do I remember anything about the meal in Coldwater? Not at all. In fact, I have a vague recollection that the restaurant was adequate, but not particularly good. But, as already noted, that was not really the point. With the sun at our tail, much less squinting occurred on the way home. Hey! Shouldn't somebody be looking straight ahead? Photo by Jamie. Before long, we were cruising past Owasco Lake again, entering the home stretch of sky to the Williamson-Sodus Airport. Back at home base, Ed was deservedly excited about his first $100 hamburger flight as Pilot in Command. Sure, breakfast was good, but the true excitement came from a brand new private pilot beginning to explore on his own. I was glad to have been a part of it. 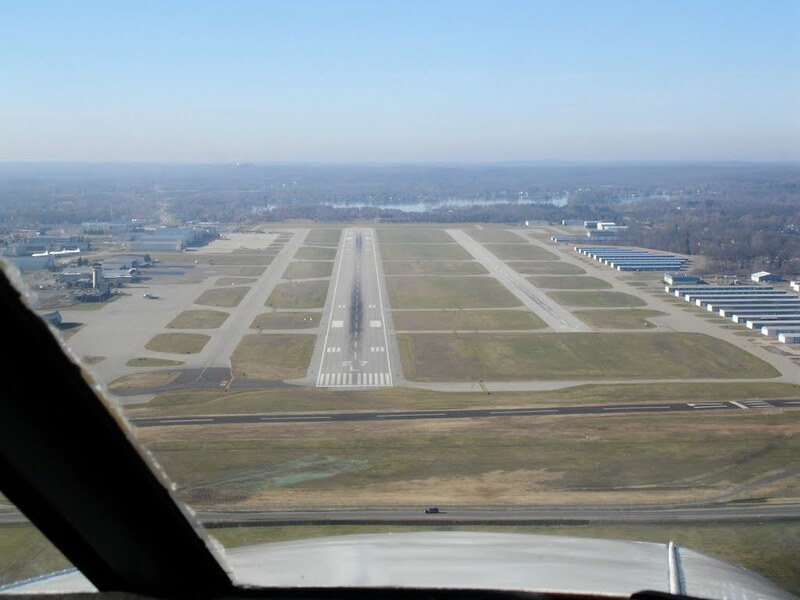 A litany of NOTAMs for Williamsport Regional Airport (KIPT) represented a rotating closure of runways and taxiways that was carefully orchestrated to keep the airport open to landing traffic. Access to my favorite breakfast stop, Cloud 9, would not be affected by the ongoing runway and taxiway work. However, the closure of the east ramp to transient parking just might. A call to the FBO that morning confirmed the problem. "They'll send you here for parking. If our courtesy car is available, you can use that to get to the other side of the airport for breakfast. Otherwise, you'll have to call a taxi." "So realistically," I said, catching Tom's eye as I summarized the situation in my own words, "Getting to the restaurant will be a crap shoot depending on whether your courtesy car is available." I was not going to pay for a taxi ride to the other side of the airport. The fellow laughed. "Yup, that's pretty much it." Scratch Cloud 9 for breakfast. It was time for Plan B, The West Wind at St. Mary's (KOYM). While I did a last check of the weather, Tom called the restaurant. Though he did not speak to a live human being, a recording indicated that the restaurant opened at 8:00 am on Saturday. Perfect. We were airborne minutes later. As we flew high above the Southern Tier of New York, ground fog tenaciously clung to the low valleys below and made for a striking view. Although there were airplanes parked on the ramp at St. Mary's, the CTAF (common traffic advisory frequency) was strikingly quiet for a popular breakfast destination. This was our first hint. Taxiing to parking, we noticed that all of the airplanes parked on the ramp were tied down and covered. These were not breakfast transients; hint number two. A piece of paper on the locked restaurant door indicating that The West Wind opened at 11:00 am was the final, and least subtle, of the hints that there would be no breakfast for me and Tom in St. Mary's. When Tom called the restaurant again, a live person confirmed that they did not open until lunchtime. "Did you suggest that they change their outgoing voicemail greeting?" I asked. We suspect that we were caught by a recent transition from summer to winter hours for the airport diner. The only problem with Plan C is that I did not already have one in mind. I realized that The Flight Deck at Dubois ("Dew Boys") was not far from St. Mary's; just ten minutes in the air. I called the FBO at Dubois Regional Airport (DUJ) to verify that the restaurant was open. It was. Plan C was a go. Breakfast at The Flight Deck was quite good, though we arrived late enough that the lunch crowd was coming in as we finished. Still, it was a beautiful day to fly and I was glad to be able to share it with another pilot. In November, a savvy pilot never ignores decent weather because there is no telling when it might return (incidentally, the same mindset applies to December, January, and February). Who knew that finding breakfast would be so difficult? Maybe some things never change.